The majority of today’s consumer products — and many commercial ones — are composed of thermoplastics. When designing a new product, engineers can best predict its end performance by prototyping with a material as similar to it as possible. That’s why 3D printing with thermoplastics is so widely practiced. Using fused deposition modeling (FDM) machines, engineers have the option of making parts with the most commonly used thermoplastics, such as ABS, polycarbonate, a variety of blends, as well as engineered thermoplastics for aerospace, medical, automotive, electronic and other specialty applications. 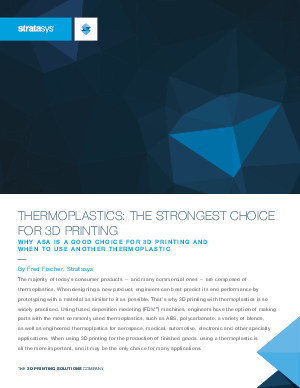 This white paper reports on why ASA (acrylonitrile styrene acrylate) is an excellent multi-purpose material for 3D printing and when to use another thermoplastic.